Who can apply to become a fellow? Data savvy: has experience working with data and a passion for teaching data skills. Understands the role of Non-Governmental Organisations (NGOs) and media in bringing positive change through advocacy, campaigns, and storytelling. Fellows are passionate about enabling partners to use data effectively through training and ongoing support. Interested or experienced in working with journalism and/or civil society. Has some facilitation skills and enjoys community-building (both online and offline). Eager to learn from and be connected with an international community of data enthusiasts. The purpose of the School of Data Fellowship programme is to build capacity among NGOs and journalists. The fellowship programme is therefore not currently offered to government employees. To apply, you will have to fill our application form and attach your CV. The form is available at this link. What kind of activities will fellows carry out? 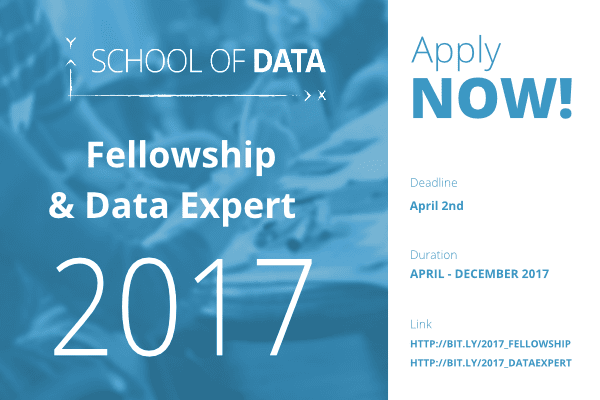 How will School of Data support the fellows? Implement an evaluation process tracking the deliverables of the fellowship. Connect with and organise training sessions and coaching with renowned experts in the areas of participatory events management, storytelling, public speaking, etc. How much time are fellows expected to dedicate to their fellowships? Our fellows are not employed full time. We ask the fellow to dedicate an average of ten working days per month. This will include taking part in online and offline workshops and trainings, organising events in and with local communities, being an active member of the School of Data community, and doing unexpected stuff spontaneously. Fellowships will receive a modest monthly stipend of up to $1,000 USD a month. This is not meant to cover them for full time work, as this is a part-time role, but we would expect them to dedicate at least ten days of effort for this amount. In addition to the stipend, fellows will have access to a small amount of funds to organise local events and travel abroad at least once.